New use for used Nespresso capsules? When I pruned my lavender a little while back, I had many beautiful lavender flowers to decorate my house with. Some I chose to dry for dried lavender bouquets, others I dried for making lavender sachets to give as gifts, and others still I made into fresh flower arrangements. Some ended up being too short to use in my other bouquets, but I (obviously) could not throw them out! I made myself an espresso and mulled over where they would go. See all those little holes in the top of a used Nespresso capsule? How perfect! 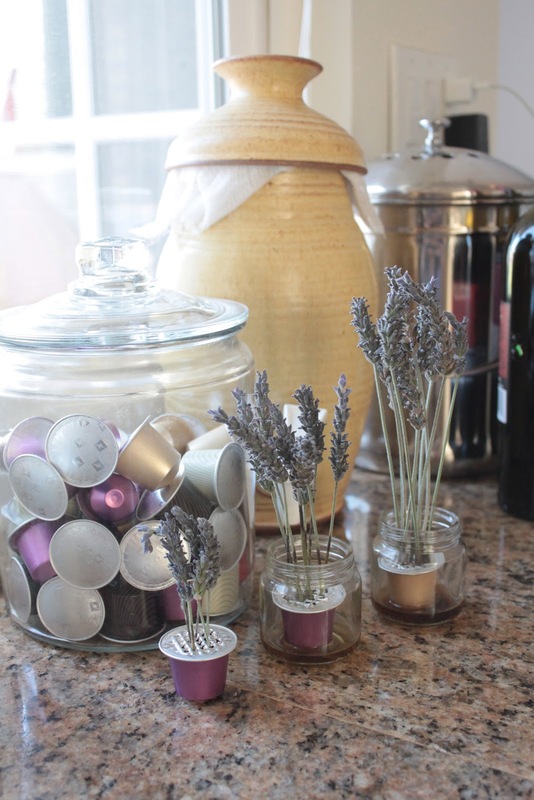 I decided to stick my lavender stems in the used Nespresso capsule to hold them upright, and then put them in cleaned out baby food jars. (The one on the end didn’t get a baby food jar because I put most of them away, waiting to be made into candles and I didn’t want to lug them out again). The baby food jar is mostly for show and to help keep the capsule upright. I thought about watering the lavender and using the jar to catch excess water, but I didn’t end up giving the flowers water, and they ended up being fine. They just dried up and continue to look pretty in their Nespresso capsules. This is obviously not a good way to reuse mass quantities of Nespresso capsules, but I like that it’s creative and pretty. Luckily for us, our area has a Sur La Table that recently partnered with Nespresso, so I can bring my used capsules back to them for recycling. This entry was posted in DIY project, photo, reuse on August 22, 2012 by seedsowingmama.